You've heard of late bloomers. A trip to the Benica (Calif.) State Recreational Park on Sunday yielded quite a surprise: a solo blossom on a bare almond tree. 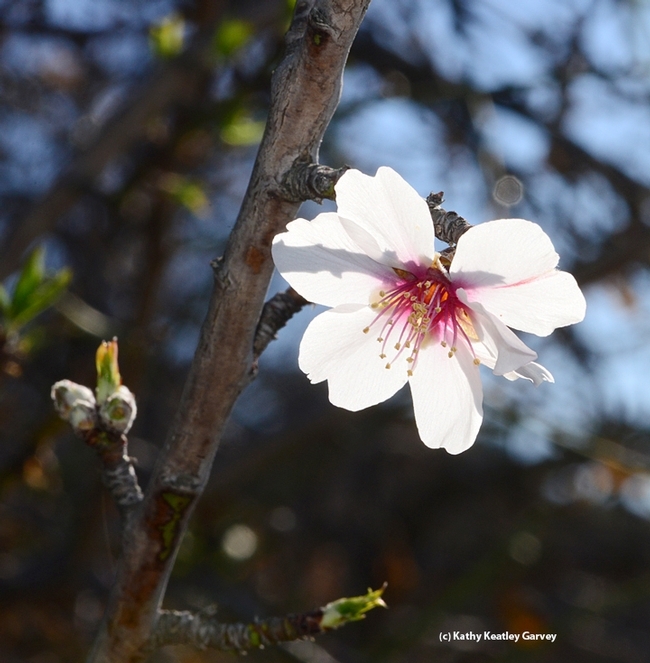 Almonds don't usually start blooming until around Valentine's Day. Almonds are big business in California. "The 2013-14 crop is estimated at 1.85 billion pounds from 810,000 bearing acres," wrote Christine Souza in the Dec. 11 edition of Ag Alert. Souza, who covered the 41st annual meeting of the Almond Board of California, wrote that "Near-record production, higher prices and room for increased export opportunities lead leaders in the almond business to forecast continued growth, with optimistic trends outweighing concerns about water supplies, increasing production costs and onerous government regulations." Read her full article. 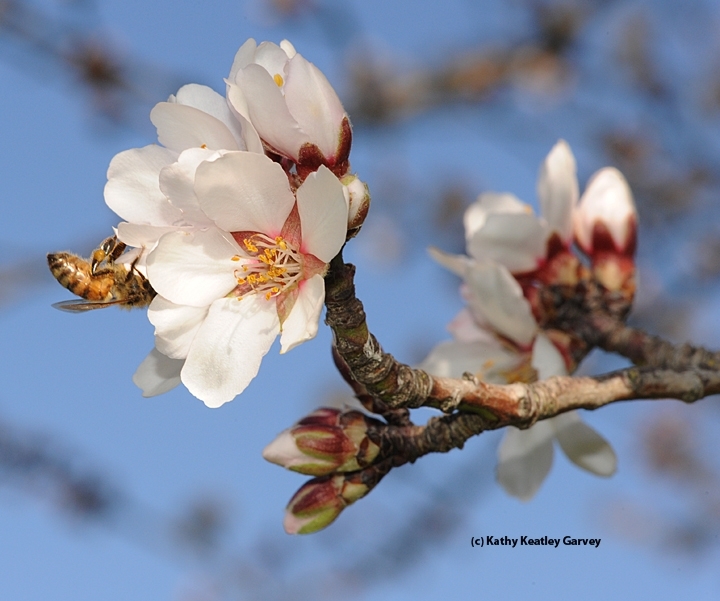 Meanwhile, while buds turn to blossoms and blossoms turn into food for hungry honey bees, Extension apiculturist Eric Mussen of the UC Davis Department of Entomology and Nematology, keeps busy answering bee/almond questions. This year marks his 38th year as an Extension apiculturist. He will be retiring in June. One of the questions recently posed to him: "Do most commercial beekeepers in California specialize in a certain area of beekeeping such as honey production, pollination services, queen bees, etc., or do most do a little of all of these things?" "Most commercial beekeepers in California try to place as many of their colonies as they can in almond pollination," Mussen responded. "That $150 or so makes up a large portion of the total costs of keeping a colony alive for a year--about $220. After almonds, most of the commercial beekeepers (bee breeders) in the Sacramento Valley turn to raising queen bees and bulk adult bees for the most part, with some further pollination contracts to keep their 'spare' bees making some income. The northern California beekeepers will hardly ever produce an income-generating honey crop, unless they move their colonies out of state, which some do. Most of the bee breeders produce no reportable honey." On the other hand, the San Joaquin Valley commercial beekeepers do attempt to earn their income after almonds from various honey sources and pollination contracts, Mussen says. "Before most crops are ready to be pollinated, the beekeepers swamp the San Joaquin citrus belt to make some honey and not have to feed their bees. There are so many resident and visiting colonies down there that the honey crop has become very small. Except for alfalfa seed pollination, most commercially pollinated crops do not produce honey. Beekeepers do place their colonies near cotton, sometimes, for a honey crop, but it is risky. The central valley beekeepers can attain the state average of 60 pounds of honey per colony, if the rains promote growth of the sage and buckwheat plants growing in the hills around the valley. "The southern California beekeepers usually average the best honey crops--closer to 100 pounds per colony. There still is a significant amount of citrus down there, and quite a few wildflowers. Rainfall remains an extremely important factor." And declining bee health? What about colony collapse disorder (CCD)? "CCD seems to be a combination of stresses that, sometimes, becomes overwhelming to the bees," he says. "These are the contributing leading factors: malnutrition, parasitism by Varroa destructor, infections with Nosema ceranae, infections by one or more of the 22 known honey bee viruses, exposure to pesticides, and vagaries of weather, especially cold weather. Commonly, colonies that are collapsing are heavily infected by Nosema and one or more of the viruses."